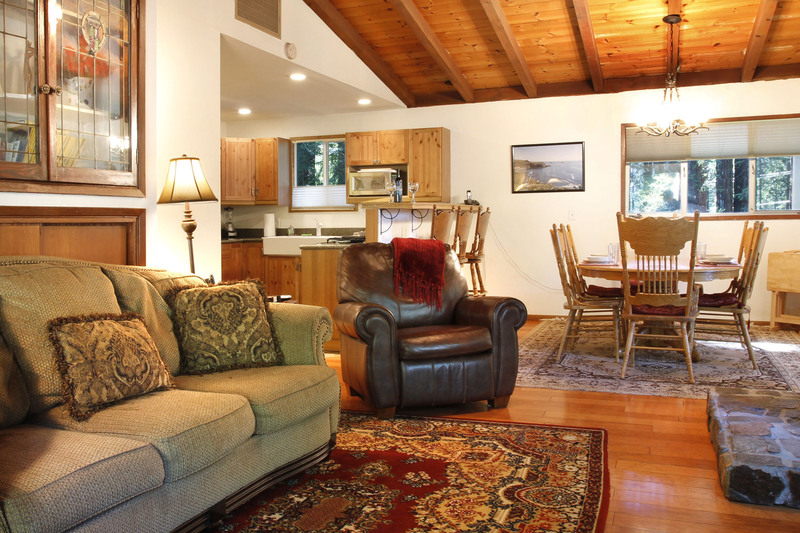 Ultimate Dog-Friendly Magic Mountain Retreat on 3 Acres of Redwood Grove and Large, Sunny, Flat Grassy Areas, Securely Fenced Half Acre, Hot Tub in Redwood Faerie Ring; Short Drive to Dining, Duncans Mills, River Beaches, Coast. WIFI. Keyless Entry. Your Well-Behaved Dog is Welcome! The living room and kitchen are open in a L, with a dining area. On a hall off the living area, there are two bedrooms and a bathroom. 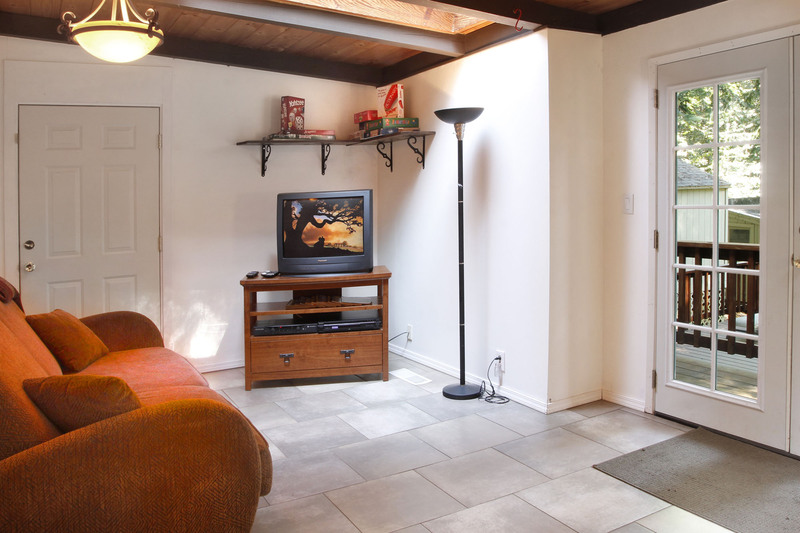 Beyond the bedrooms, there's a sunroom with desk set, another TV and comfy couch. 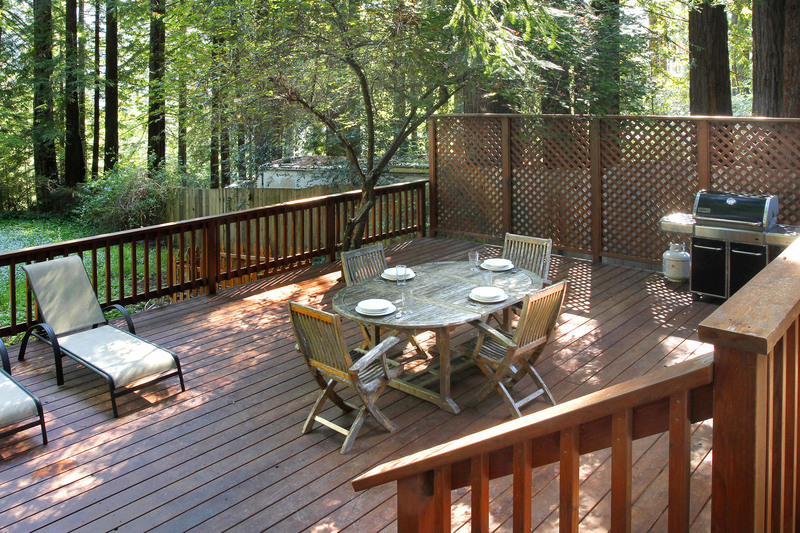 This room opens to the large deck with outdoor dining and yard beyond. 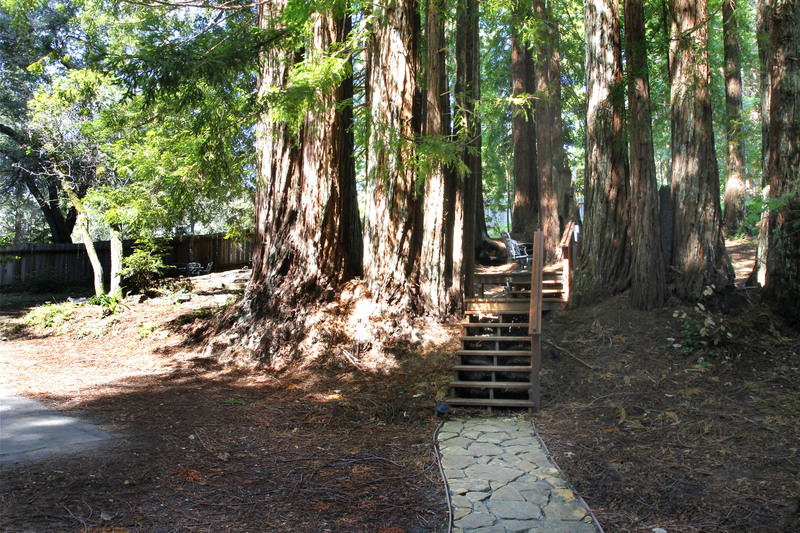 Out the front door, to the side of the house, there's more yard with seating areas under the redwoods, large, flat, grassy dog agility area (equipment seasonal), and hot tub on its own deck in a ring of redwood trees. House is approximately 1260sf. 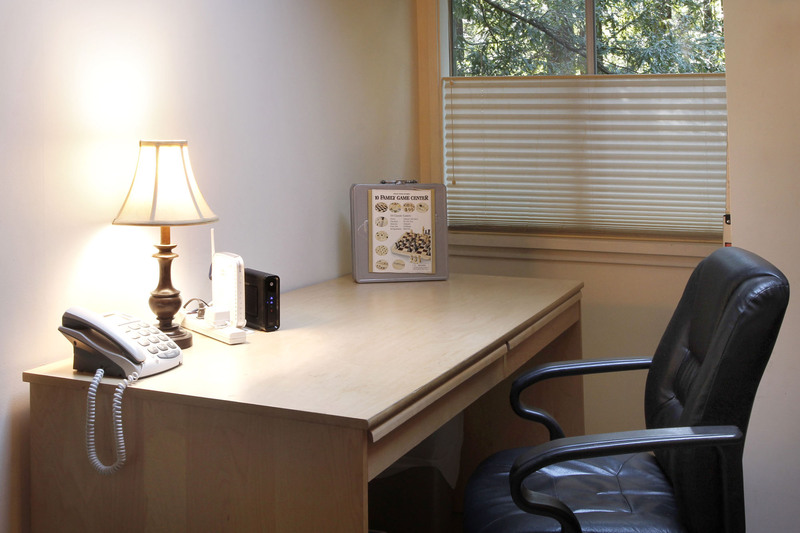 We offer 24/7 guest care and concierge services! 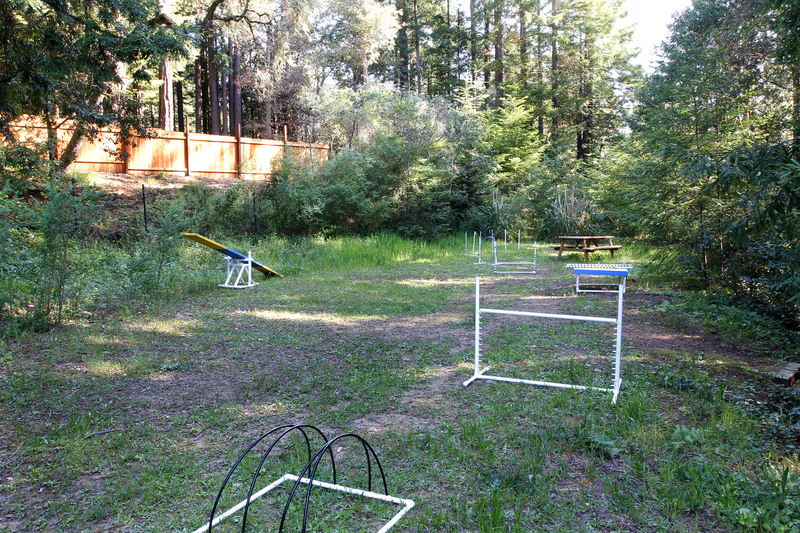 We loved our stay and the dog agility course was a favorite of our pup's! We spent a great memorial day at this cabin. We were originally booked at another cabin, which ended up being unavailable at the last minute, however they were great about getting us set up at this cabin instead. Thanks! Nice serene space, cozy home. 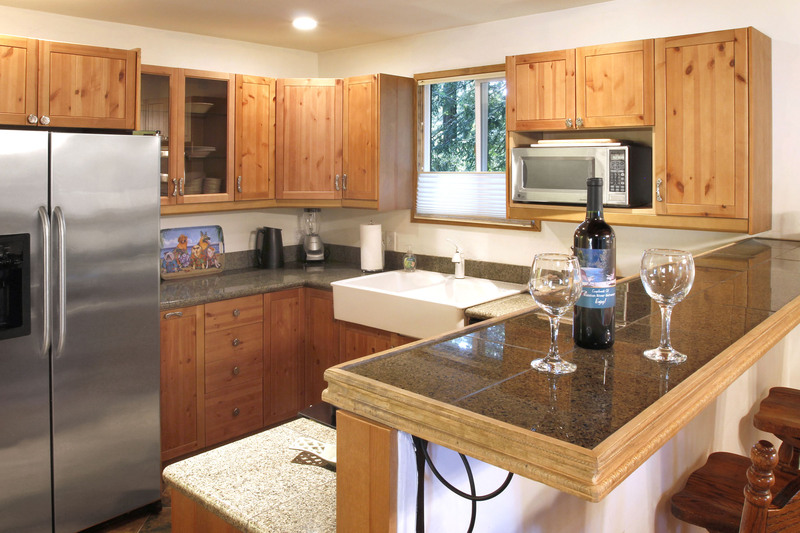 Stocked kitchen, great board games, and relaxing place to spend a weekend! The yard is perfect for dogs, but the amenities are funky. 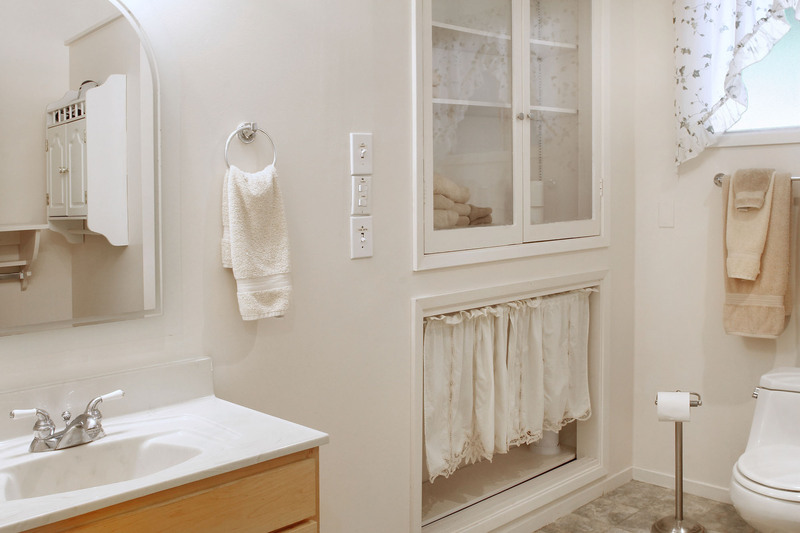 Bring your own towels and linens. My husband kept hearing noises in the kitchen and discovered a huge rat pushing a rodent trap back and forth in the cabinet under the sink! We enjoyed being close to the river and the ocean but for what we paid, the accommodations were definitely not worth it. Communication was quick and clear. Would advise to screen shot the door code instead of relying on phone service, or Wifi. The location is breath taking. It is perfectly secluded and quiet. I don't remember the last time I've been out in the woods and it was 100% silent. There is a Safeway near by for any shopping needs and there are so many wonderful hiking locations less than 10 miles away. I highly recommend this location! We loved our stay here. 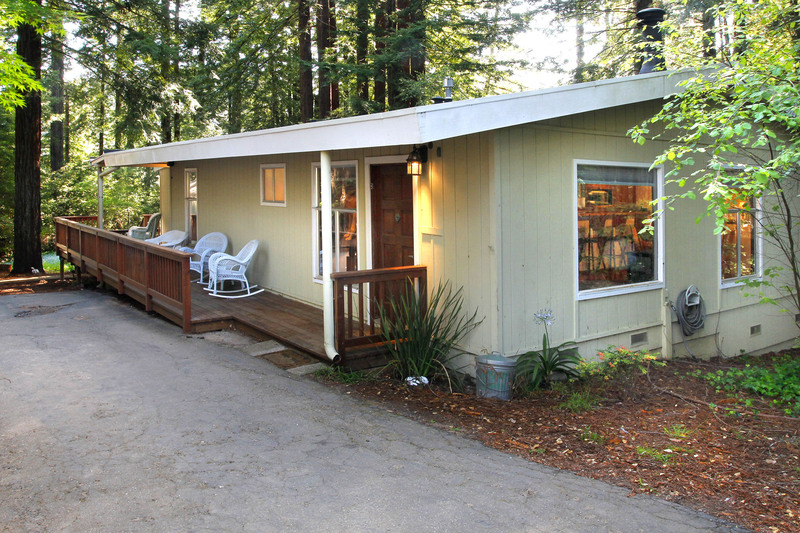 The house is close to the ocean, close to the river, and sitting in a bit of lovely redwood forest--a great basecamp for adventures in the area. Enjoyed our visit. Lovely environment so still and quiet. Dogs enjoyed the yard and we all loved the cool weather. Road up to the house is pretty torn up - hope the locals fix that - rough on the car. Loved visiting the forests and the beaches. PERFECTION! about sums up our stay. We all give this vacation a 10. Thank you. 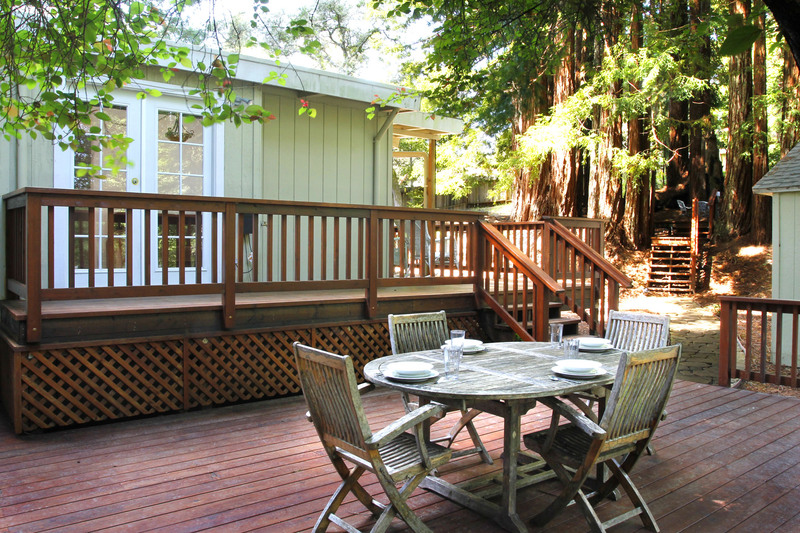 Lovely house in a very quiet neighbourhood, about 20mins drive from guerneville. Nice terrace as long as you are not afraid of mosquitos, they are vicious in this area! 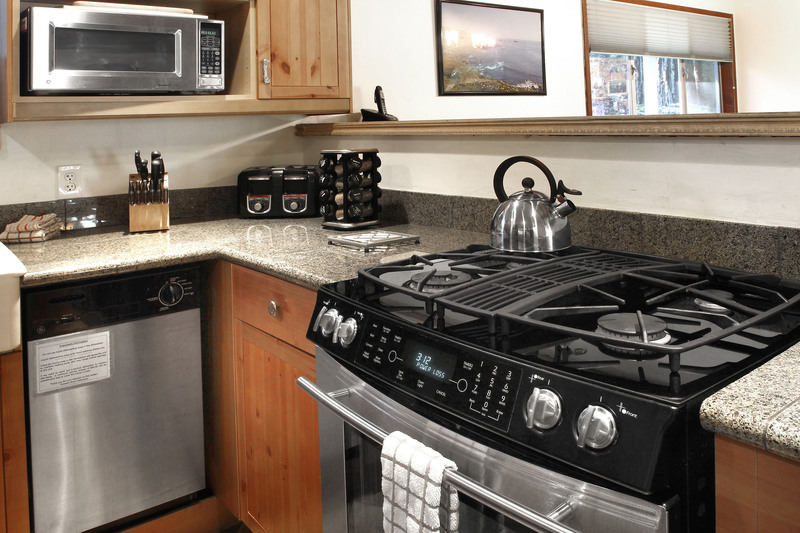 Well equipped kitchen, all amenities well explained. Make sure you come with a dog or are a dog lover because the entire house is decorated in dog memorabilia, quite funny..
Well, easy access, the house was 10-15 degrees cooler than the surrounding area...especially when there was a unusual blistering heat wave. My favorite was every gadget advertised, from dishwasher, to TV, to Hot Tub Worked marvelous and came with well written instructions if there was a doubt. Great place to stay. Beautiful area. Very private. Hot tub was in excellent working order and we enjoyed this feature. Kitchen well equipped. We had an excellent time. Highly recommended. Well-behaved dog paradise ... Watch for the stickers this time of year and the barking dog(s) next door. "We had a wonderful time, and so did our dog!" We had a wonderful time, and so did our dog! It was such a cozy place. We cooked in a few nights and enjoyed a dinner out in Guernville one night. The house was as described but the pictures of the yard don't do it justice. Had a great time in our weekend away in the woods. We enjoyed staying at Wagging Woods with our pup. He explored the grounds and we enjoyed taking him on morning and evening walks. The house is surrounded in trees and the peace and quiet is so relaxing. The house was clean and only downside if I had to write on was the jet tub did not work. Everything else around the house made up for it. We can't wait to book our next trip here. 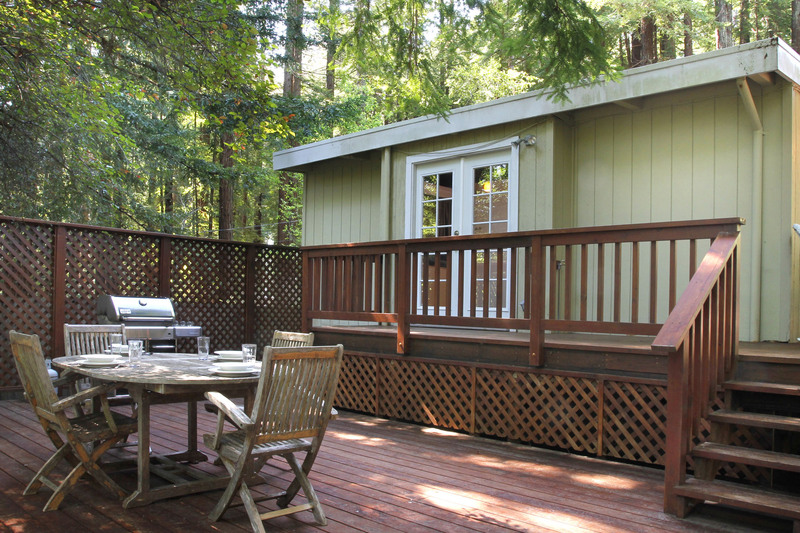 We were in town for the Ironman Competition and were looking for a home close to the swim at Johnson's Beach in Guerneville. This home had everything we needed and we were wishing we'd been able to bring one of our pups with us! "Perfect private cabin in the woods-"
We loved it! Quiet &amp; private &amp; relaxing getaway. 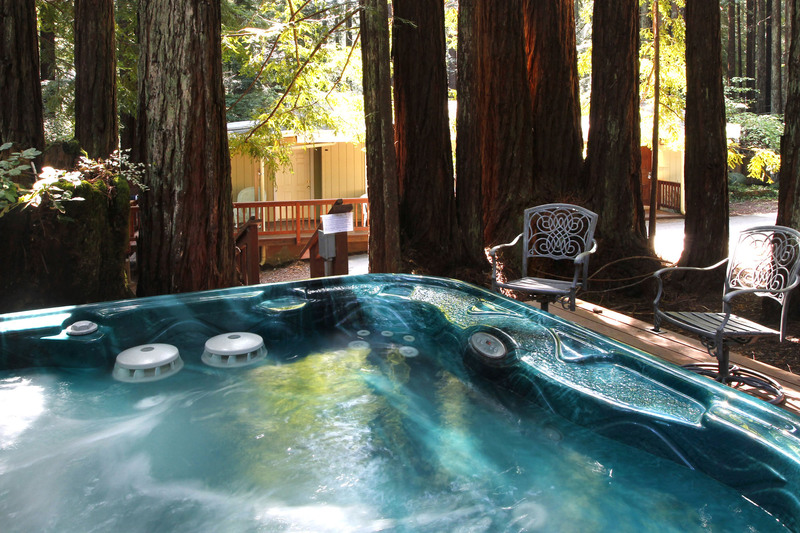 The hot tub is amazing in a circle of redwood trees. The house has a good sound system for music &amp; movies. Nice kitchen. RRGetaways.com was very helpful. This one is not near a river or town. It's a place to unwind. We'll be back. This is our third rental from RR Getaways and by far our favorite. The house was clean and well furnished. The kitchen had everything we needed. The bed was very comfortable. The property is very quiet. Our dog had a wonderful time exploring the grounds; we did not have to worry at all since it is securely fenced. The hot tub in the woods is so peaceful and relaxing. We had a fantastic time and will be back in September. We had a great time, house was very comfortable for 2 couples. Beautiful kitchen and good quality furniture. Our furry babies had an amazing time exploring the huge property. The only downside: grassy area had a lot of weeds. Overall we enjoyed our stay and definitely will come back. We apologize for the weeds in the backyard. We had such perfect weather for our plant friends and they got out of hand. We're very happy your stay was enjoyable otherwise! Comeback soon. In the past 10 yrs, we have planned an annual trip with RR Getaways, and each time we pick a different vacation home to enjoy. Of the many we have stayed, Wagging Woods is far the best and one we will rent again. The property is huge and fenced, making it safe for our fury babies to run, play and explore at their leisure. The hot tub was to die for and could not ask for a better way to end the day. 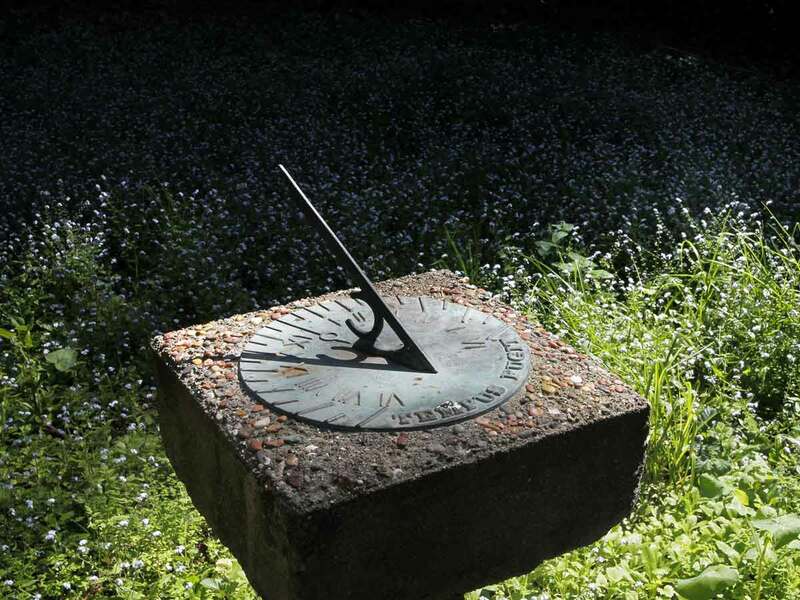 The grounds was simply perfect for my husband and I and our dogs. 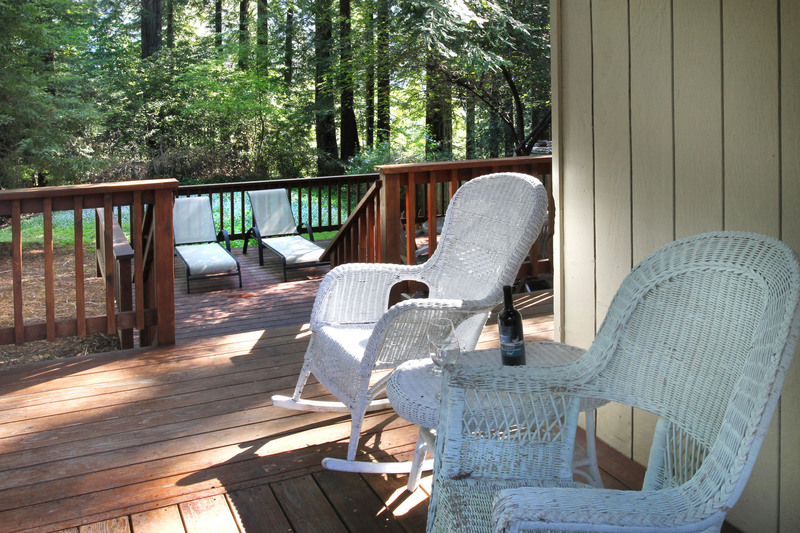 Huge deck to relax and enjoy the redwoods. If you bring your dogs, just know the neighbor does have two dogs. We had to block our dogs from going to the fence because their dogs started to fence fight. This did not deter us from enjoying our stay at this home in the least. I will say the neighors did keep their dogs away from the fence as well. Like I said, this will not be the last time Wagging Woods see's us. "Peaceful, Quite, Beautiful and Heaven for Dogs!" We really loved this place and so did our dogs, Pumpkin and Coco. While we relaxed in the Hot Tub, the pups wandered the spacious grounds and had a blast. The house was very nice and had everything there you could ask for! The Kitchen was well equipped and we cooked at home the entire time. There was also a Fantastic gas grill outside on the huge deck. Since it is Winter here we also enjoyed the cozy wood burning stove in the Living room. We will return again! This is by far one of my favorite rentals and I have rented quite a few. The property is very large and fenced in which was our biggest joy for our Lab to run &amp; explore all day. I will say...don't bathe your dog before coming. The property is rustic. My foo foo dogs were covered in little balls fron the redwoods. Totally worth it though! This place is so awesome it was worth brushing everyone every night before bedtime. The grill they have is so nice. A Weber like I have at home. Not usually something you find at a rental but this place has that extra touch that puts them above the rest. Definitely my new favorite rrgetaway rental. Can't wait to go back! High in the moutain,beautiful house. Really enjoyed our stay. Hot Tub was lovely and so full of bubbles.Thanks for sharing. 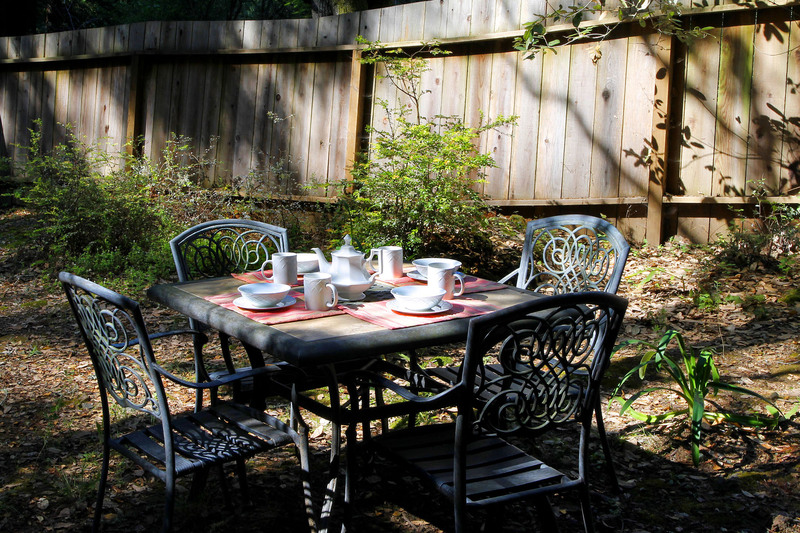 "Wagging Woods - a perfect getaway for dogs and people!" Wagging Woods was a perfect place to stay for me and my 94 year old mom. The house was spotless and comfy. For my mom it was a perfect house as it was not so big that she could get 'turned around'. She loved the big recliner in the living room! The three acres of grounds were perfect for my dog Copper. He was in doggy heaven. This is the second time I have stayed in Wagging Woods and I will return again. We had a great experience here and the dogs loved it as well. The grounds are beautiful, though we would have loved to have access to the wild area beyond the back fence for a bit of hiking and exploring.It was cold out and the wood stove really kept the place warm. Hot-tubbing in the rain is great also. Our dog had a wonderful time with the huge fenced yard. The hot tub was very comfortable and in a beautiful setting. 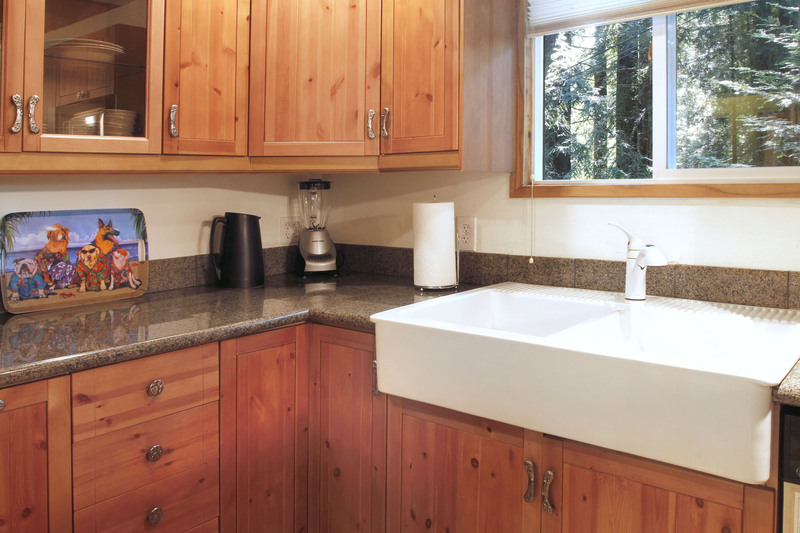 Also, the kitchen was nice except for the small size of the dishwasher. There were lots of games and Dvds, and the decks were nice. 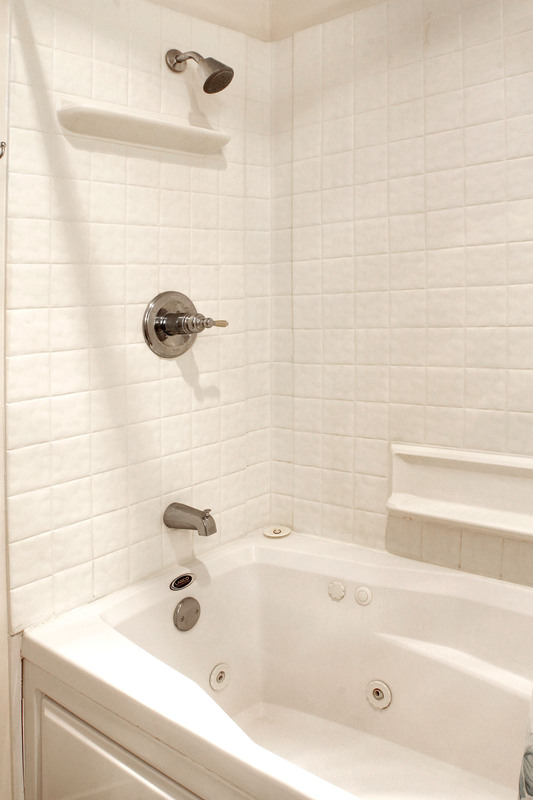 But the bathroom was funky - there was mold along one edge of the tub and the electricity (fan and outlet) sometimes worked and sometimes didn't. The worst thing was trying to sleep. The walls are thin, and the doors are all pocket doors which are really loud if someone gets up in the middle of the night. Considering the cleaning fee, I was shocked that we had to hand-wash and put away our dishes before we left. We weren't even allowed to put them in the dishwasher and start the cycle; they had to actually be put away. Because of this, the dishes weren't all that clean when we arrived. Altogether, it seemed pretty expensive for what you get. This house is really cute and the property is beautiful. 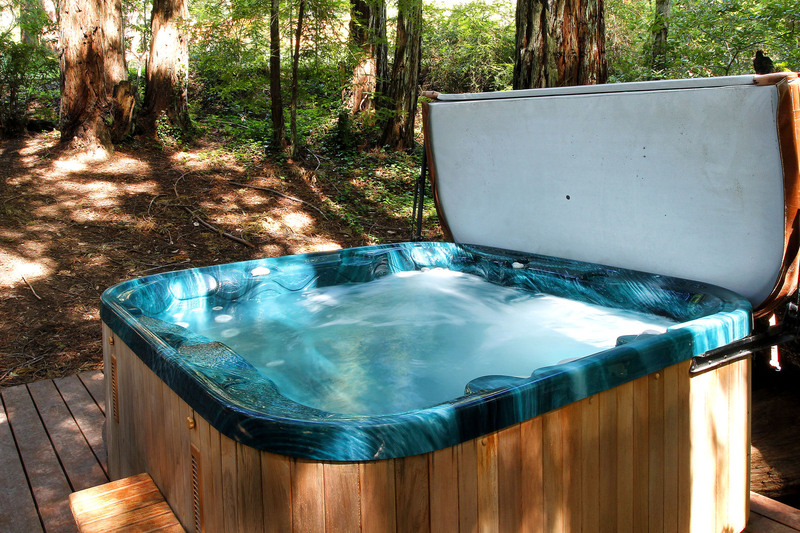 The hot tub in the center of the fairy ring of redwoods is magical. Nice BBQ and kitchen as well. The dogs loved the large area to explore and play in and even enjoyed the agility course. A few things that were negatives: 1. The property next door is a mess. 2. There was a dog that howled all day long nearby. This is difficult to listen to if you are a dog lover. 3. The house wasn't cleaned when we arrived and it was FILTHY! There was THICK dog hair everywhere including the couches. The bathroom was so disgusting that I wouldn't even consider using it. I contacted the rental company and they had someone come out. He did a pretty good job but there was still some residual hair left behind. Not surprising considering what there was to begin with. They need to give this house an intensive cleaning based on my experience and the last review. I would recommend this house for it's location and privacy if it were throroughly cleaned. "Lovely place!... if only it was cleaner"
Wagging Woods is a great location. The area around here is outstanding, and my husband and I had previously stayed at Blackberry Bliss 2 years ago and wanted to return to the area with our dog and with more family (sister and her husband) - so we were looking for a house with more room in the same area. - The house is very spacious and well equipped.. the yard is huge and totally secure for a dog to explore freely - which was real bonus.This would have really been an ideal location and holiday and would have deserved a much better rating than I gave it - if not for the fact that I found the house really dirty, to the extent that it would put me off ever booking it again. On the surface it looked ok as we walked in - pretty tidy and kitchen and bathroom were clean. However, I ended up cleaning all the sheets when we arrived after a 10 hour car journey (they smelled like they had not been washed - especially the pillows). The soft furnishings throughout are full of dust, and the area rugs full of dust and dog hair. Floor under our bed looked like a dog grooming parlour - more hair than I care to remember. Just nasty. I hoovered up as much as I could (hoover pretty ineffective as also full of dog hair and had not been emptied, filters blocked etc. Refused to tackle that - so probably still like that).Regardless of all this, the area is so beautiful and (other than the cleanliness) the house is ideal - so we ended up having a good time. But I stongly recommend that this house undergoes a really professional clean to keep the renters happy.. and their dogs flea free!Only other disappointment was the hot tub. What a great location! Sadly it stank of chlorine / bromine - and when we turned the jets on, was too foamy to use. We needed a place that had everything we needed to relax, settle in , read a good book or two, cook with ease, and enjoy bringing our dog. It was all of that. It was perfect for us. The hot tub in the circle of redwoods was my favorite place. I loved the books about dogs. We took video of our dog going through the obstacle course. "Nice quiet location on large lot"
This is a very nice house, with more then we needed for two people and a dog. The interior is much larger then expected with a great kitchen. Large fenced in yard, with plenty of places to eat outside if you wanted. 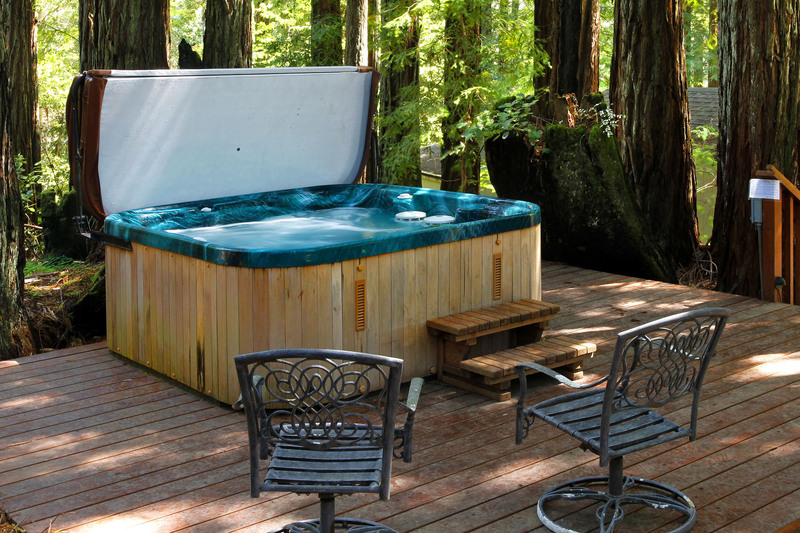 Great hot tub in the middle of a redwood tree circle. Not to far from Guerneville Rd. Wagging Woods wasthe perfect place to spend Christmas away from home! We couldn't have asked for anything more!!! The house was beautiful (nicer than the pictures online), the property was spacious and perfect for our two golden retrievers and the kitchen was well stocked with all of the amenities. We loved every minute of our trip. 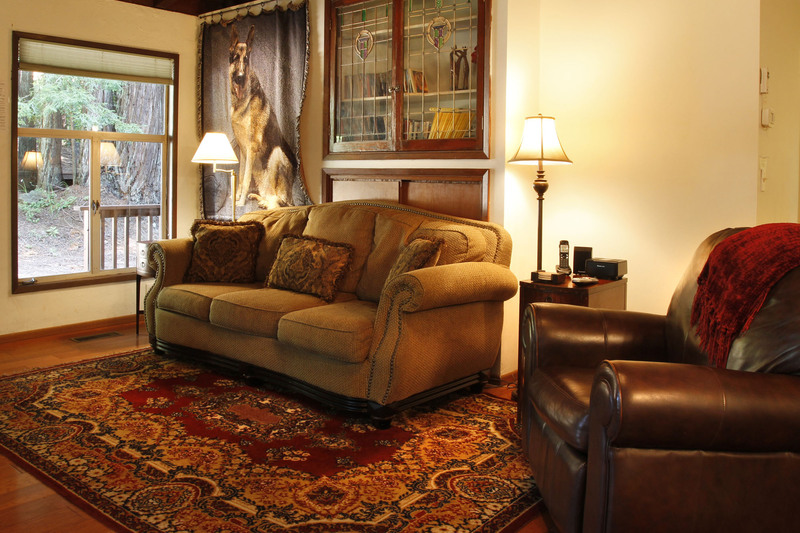 The house and property were extremely dog friendly and very comfortable for canine and human occupants. We were completely relaxed and didn't want to leave at the end of our trip. 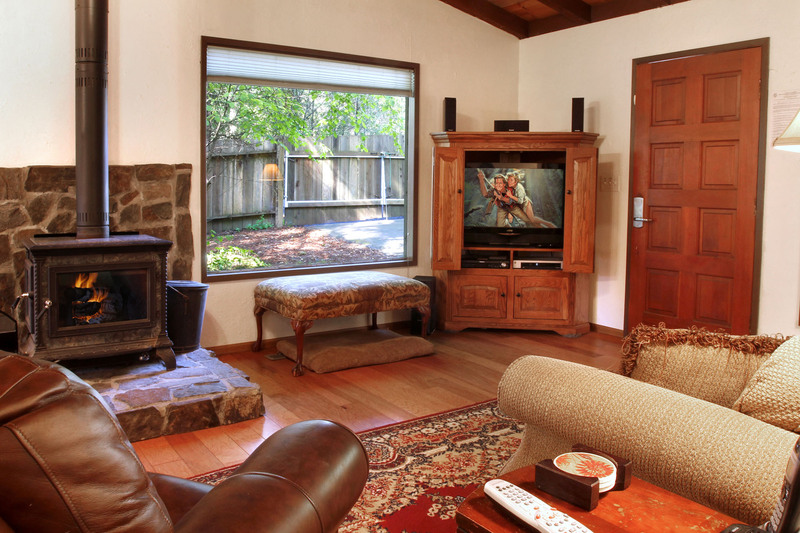 There is nothing better than watching your dogs enjoy nature while sitting in the jacuzzi nestled in a ring of enormous red woods...we could have stayed in all day long if we would have set it up with the concierge services to have someone make dinner for us :-). Thank you for sharing your property with us and for keeping it dog friendly...we will definitely be back! 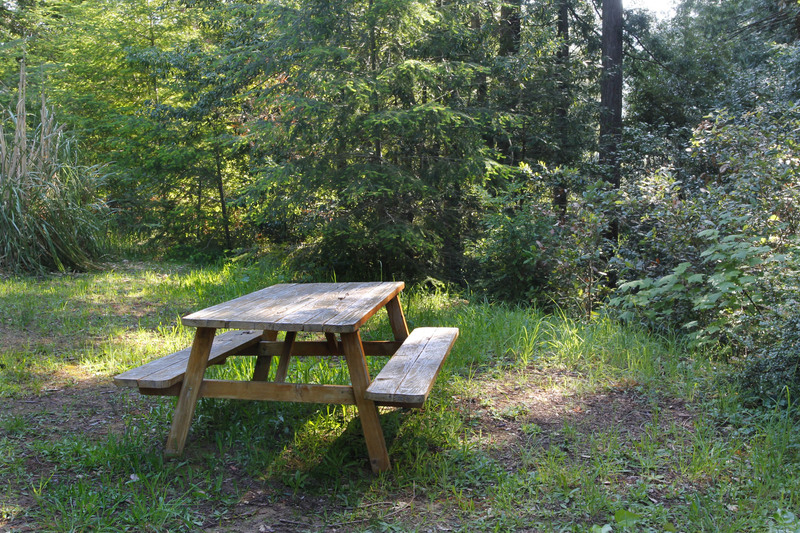 "Peaceful place cradled in nature"
Wagging Woods is a peaceful, out of the way place that offers a quiet, relaxing vacation amid the Redwoods. It is very dog friendly in that it has land for them to run free and a good fence so one does not have to worry about them.The amenities that are provided help make the stay comfortable. 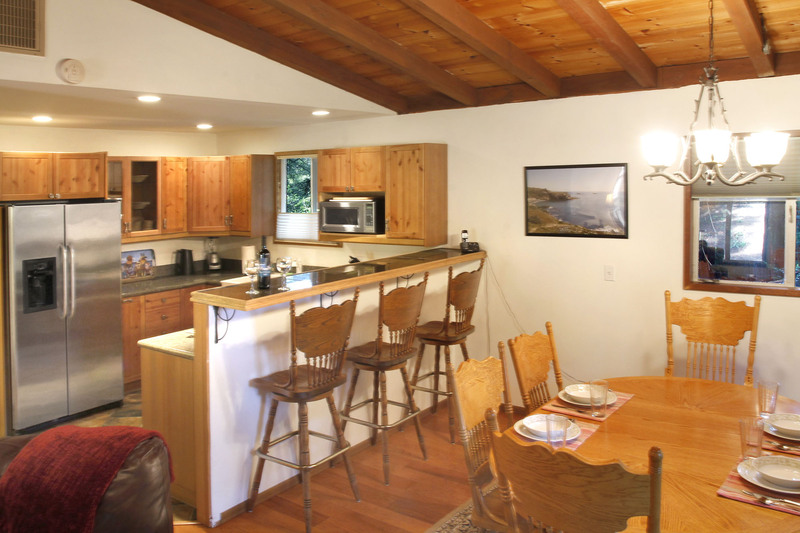 It's location is great for a short trip to the ocean or towns of Guernville, Monte Rio, or Bodega Bay. The property is beautiful and wonderfully relaxing! Loved the hot tub! Our dogs had a great time exploring and playing on the agility equipment and, best of all, they were completely tired out by the end of the day. The house was comfortable and well-appointed. We very much enjoyed our stay! "Good location but not clean"
The land around the home was beautiful. The house was not clean! We are so apologetic about the poor cleaning---we do have high standards for cleanliness and this was unacceptable. The cleaner has been fired! We wish this guest had called us immediately as we would have sent a cleaner to remedy the situation--we never want our guests to suffer! The staff at Russian Rivers was great (a shout out to Mike who patiently answered all my questions). The keyless check in was very convenient. The house and grounds are prettier and far more lush than the pictures on the website would suggest. 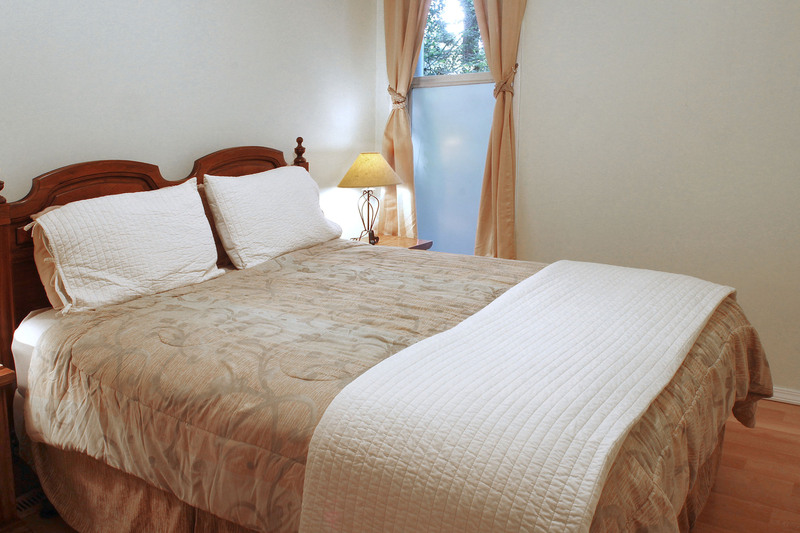 The accommodations were perfect for us; I was traveling with my mother and sister and, with two bedrooms plus the futon in the sun room, we each had our own private space (and my sister said the futon was very comfortable). Our four dogs loved having the big fenced yard to explore. The neighborhood was very quiet -- it's an eclectic mix of rustic homes and upscale vacation places, on a narrow, winding mountain road (a walk up or down the road will give you and your dogs a great aerobic workout). 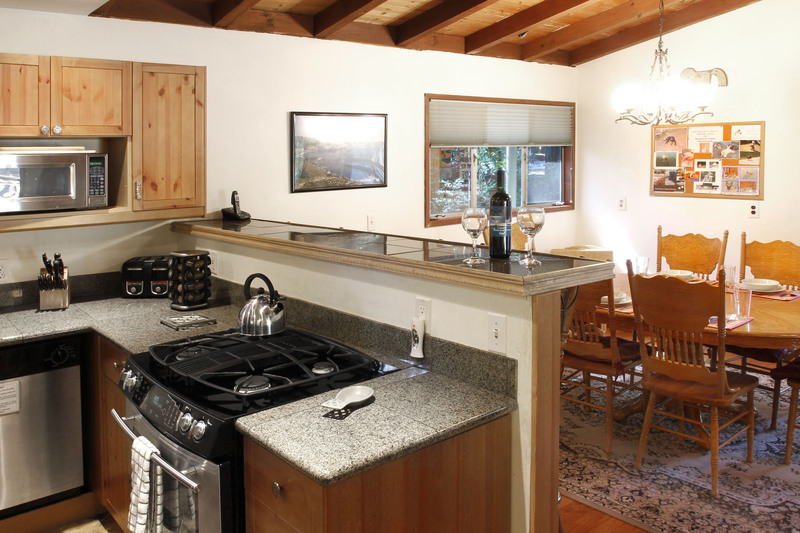 The kitchen had everything we needed, and the whirlpool tub in the house was a pleasant surprise (the outdoor hot tub under the redwood trees is awesome). It's very easy to explore the area from the house -- we particularly enjoyed the Sonoma beaches and you're only about fifteen minutes from the coast. The only flaw, and it's a minor one, is that, if you are like me and have really good hearing, when you are outside you may notice the noise from the gravel mine, which is over a mile away on the other side of austin Creek. (At first I thought I was hearing road construction noises -- that's what it sounds like.) The mine shuts down in the evening and on the weekend, and we were gone most of the day exploring, so it really wasn't an issue. 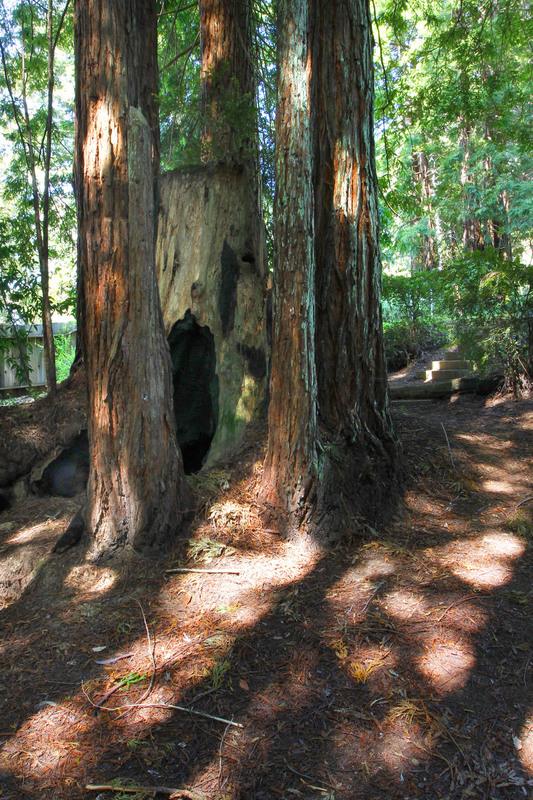 Otherwise, the house and neighborhood are very peaceful -- we could hear owls hooting in the redwoods at dawn and dusk. 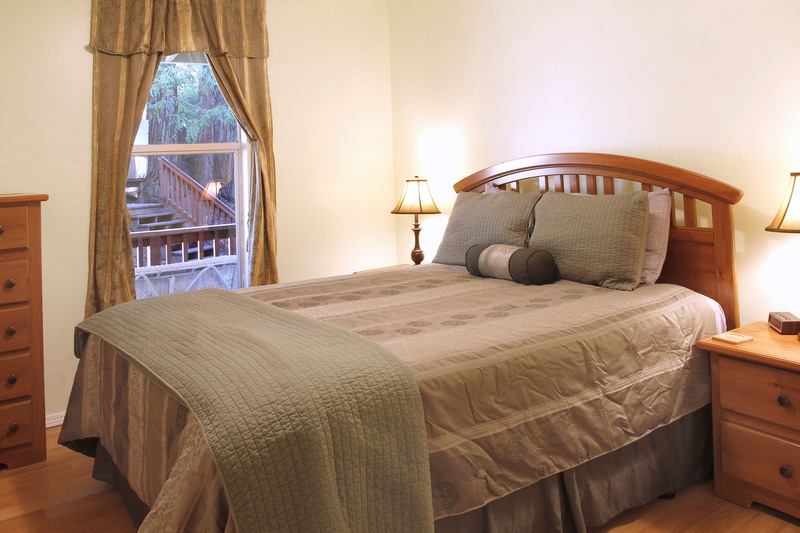 Russian River Getaways were great at providing the information needed in a timely fashion. The house was fabulous and we had a wonderful time! We took all 4 dogs with us and they had a grand time sniffing round the 1 acre backyard. It was so private! The house was beautiful, there was nothing we were short of! We also took advantage of the 'come to your property' massages - the masseuse was great, just a wonderful time! Due to work and other obligations, we could not get 'away' until January of this year. For those that are curious, off season is a wonderful time to visit the River; it's chilly and usually rainy but at this time, you have immediate access to all the wonderful shops and businesses that are open; the weather adds a different ambience that lends to great 'fireplace' gatherngs; and, the prices are lower! 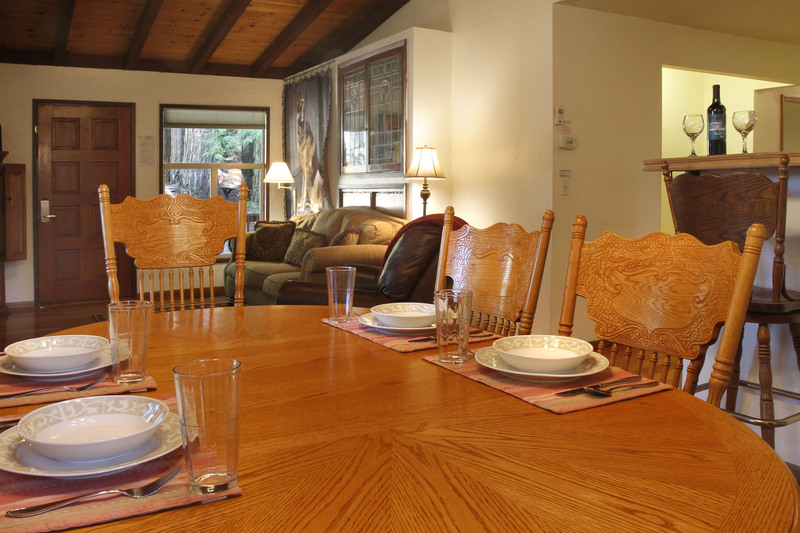 We chose Wagging Woods because it's more secluded up on Magic Mountain in the trees; has about 3 wonderful enclosed acres and a house really geared towards dogs, and most importantly, has a fabulous central heating system! These things count so much and 'fit' the bill perfectly. 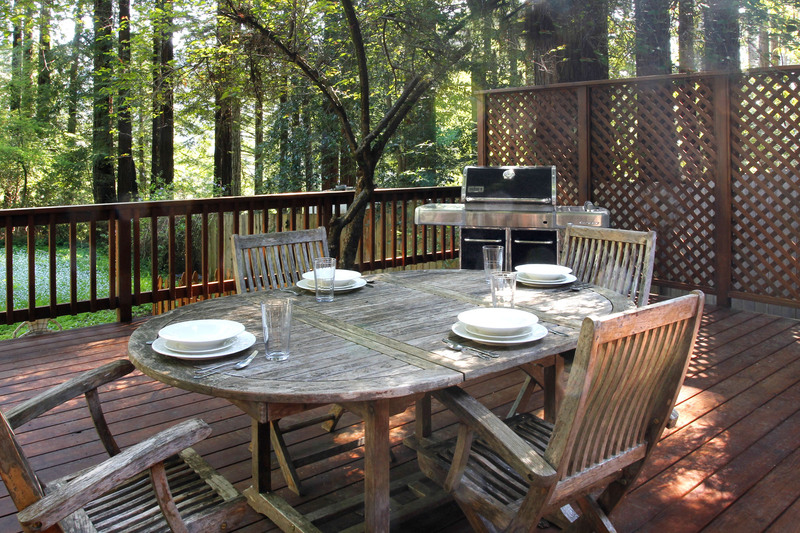 We had many dinners 'el fresco' out on the deck mid-afternoon when the temp was just right; a fabulous, refreshing and enchanting winter experince in the redwoods. This would be the 5th or 6th time we have rented from RRG in the past 10 years; the staff is wonderful; any minor issues that cropped up were immediately addressed and taken care of. We loved our short time at Wagging Woods it was so relaxing and secluded...The accomodations were updated and lovely. Our dogs loved the acre to roam and our Shepherd was a star on the agility course...we can not wait to return someday soon! !